My Husband and I stayed in our own home in the city of Krugersdorp, he worked for quite a larger salary. Although our home was paid for and we had NO OTHER Debit, but we still had our monthly payments. My husband then got ill with cancer, and had to stop working, which meant that we could no longer afford to stay in our home. I listened daily to your broadcasts never missed one. I learned to Trust God – Get scripture concerning my problem and pray about it. A few days later, we went to visit my daughter which was staying on a farm in the Lichtenburg area. We met the owner of the farm (we never mentioned our problem of my husbands illness or our finances) then the owner said “I have an empty house, please come and stay with us” Note this was the first time we ever met him. ALL THE GLORY ONLY TO GOD!!! We have a lovely home on the farm my husband always wanted to stay on a farm as farming is his passion. We have the right to stay all our lives in the house, they had that added to their will. The owner changed the building of the house to suit us, we can use as much ground as what we want. We are staying for FREE, we do not have to pay electricity or water and we have servants to do the garden. We have chickens and sheep and a very large veg garden. And most of all MY HUSBAND HAS BEEN HEALED!!! 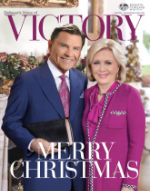 Thank You Kenneth Copeland Ministries for teaching me The Word.